The Washington Post had previously sketched out all the ways that the scandal of its own allegedly murdered columnist Jamal Khashoggi could damage US-Saudi relations at a crucial time for crown prince Mohammed bin Salman, but late Monday we caught of a glimpse of just how much damage will be done given the White House and State Department's first official statements: likely none at all. On Monday President Trump for the first time addressed the Khashoggi disappearance and widely reported news about this murder by the Saudis at their consulate in Istanbul: "I am concerned about that. I don't like hearing about it and hopefully that will sort itself out." The president said further of rampant speculation over his disappearance: "Right now nobody knows anything about it. There's some pretty bad stories about it. I do not like it." And Vice President Mike Pence said he was "deeply troubled" over the reports. Meanwhile, according to CBS News, "The Washington Post published a surveillance image Tuesday showing its missing Saudi contributor walking into the Saudi Consulate in Istanbul a week ago, just before he disappeared. Turkish officials have said they fear the columnist was killed there, and announced on Tuesday that they would be searching the consulate as part of their ongoing investigation into Khashoggi's disappearance." Last known photo of Khashoggi, who appears to be entering the Saudi consulate in Istanbul, obtained by the Washington Post. Adding to Trump's it "will sort itself out" statement, the State Department addressed the Khashoggi issue with only few more words as it essentially called on Saudi Arabia — the presumed murders — to investigate themselves, as WikiLeaks aptly noted. The statements reads: "We call on the government of Saudi Arabia to support a thorough investiagtion of Mr. Khashoggi's disappearance and to be transparent about the results of that investigation." This was precisely the reaction of the State Department when Saudi Arabia bombed a packed school bus in Yemen in the early part of August, killing 25 children. At that time the US also asked for the Saudis to investigate themselves, and naturally nothing came of it. In related news Thomas Friedman has written a strange column entitled Praying for Jamal Khashoggi — likely spurned by embarrassment over his prior fawning endorsement of MbS — wherein he pretends to have always been a wise longtime critic of Saudi Arabia. While Friedman doesn't at all rescind his earlier endorsement of MbS, he did manage to out Khashoggi as a prior source. Khashoggi, who is well-known to have had "insider" status in Riyadh, had been an "anonymous" source for Friedman's prior commentary on MbS. Yet Friedman has decided to out his source even as Khashoggi's fate is anything but settled. Despite Turkish investigators believing that the Saudi journalist was brutally murdered inside the consulate, and his body cut into pieces after which it was taken in bags out of the embassy and flown back to Saudi Arabia, there's much speculation that Khashoggi could have been kidnapped and is being detained much like last year's Ritz-Carlton imprisoned princes ordeal. Should it turn out that Khashoggi is still alive, Friedman's outing Khashoggi as a prior anonymous source will be used against him and could serve to seal his fate. Other journalists slammed Friedman for both his self-serving narrative and outing Khashoggi at this crucial time. It seems there's not a single Friedman supporter out there at the moment, even among the usual synchopantic mainstream press. 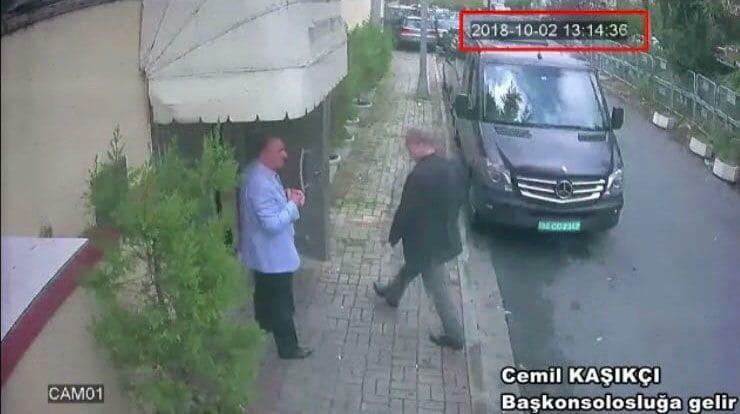 Now with photographic proof that Khashoggi did actually enter the embassy at the time his fiance said he did, only to never emerge again, things are about to get a lot more interesting.